Many of us are well aware of the impact media has on children in the early stages of their lives. It may seem as if popular animated TV shows and movies are all about fun and imagination, while that is certainly an aspect of it, the subtle, more subconscious messaging that gets told through this medium cannot be ignored. The Disney Princess phenomenon is well known for pushing the trope-y idea of girls and women waiting for their “prince charming” to arrive in their lives to give it meaning. They have in recent years begun to change this narrow-minded idea of what it means to grow up female, as it limits girls to thinking this is what they are meant to aspire to in life. That change we’ve been seeing is thanks in large part to the voices of many parents, educators and people generally unhappy with this idea of women being told, from a young age all the way through adulthood, that being happy and successful means finding a man and entering into a heterosexual relationship. We’ve written about numerous creative projects launched by everyday parents and adults who want theirs and others’ children to grow up with a diverse idea of what you can aspire to be in the world, especially if you are a girl. One such creative is Matthew Cherry, a Los Angeles-based director who recently successfully launched a Kickstarter campaign to fund his first animated short film called ‘Hair Love’. Having directed live action films, short films and music videos previously, this project was very different to his others. In his fundraising video and on the campaign page, Matthew explains how his animation is promoting hair positivity in the African-American community, and talked about the inspiration behind the film. “I’ve had the idea for this project for a couple of years now, but it wasn’t until I recently started coming across a lot of viral videos of black fathers interacting with their sons and daughters online that I finally had the confidence to try and make this a real thing,” he said. ‘Hair Love’ centers around the relationship between an African-American father, Stephen, his daughter, Zuri and her hair. Despite having long locks, Stephen has been used to his wife doing his daughter’s hair, so when she is unavailable right before a big event, Stephen will have to figure it out on his own. This sounds simple enough, but we soon come to find that Zuri’s hair has a mind of its own. 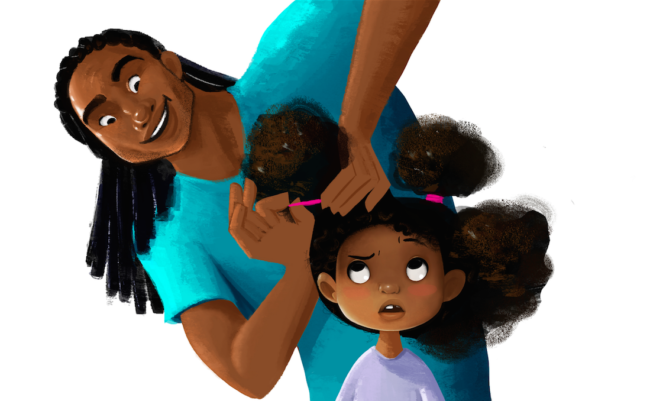 “This story was born out of seeing a lack of representation in mainstream animated projects, and also wanting to promote hair love amongst young men and women of color…Through this project, it is my hope that we can show a positive image of black fathers and their daughters, while encouraging natural hair and self-love throughout the world through the animated space,” said Matthew. He had initially been looking to raise $75,000 and ended up with over $280,000 in money to make this film! When we see projects like this garner such a lot of attention, it’s clear that there is a need for more diverse voices disrupting the bigger companies that may dominate a market, such as Disney. A film like ‘Hair Love’ is so important as it can speak to issues and stories ripped straight from real news headlines. You may be familiar with any number of recent stories from around the US, as well as countries like South Africa, where girls have been unfairly discriminated against because of their natural hair. The various schools these girls attended have strict uniform policy clearly failed to take into account a person’s natural appearance, and as a result, the stories have gone viral. 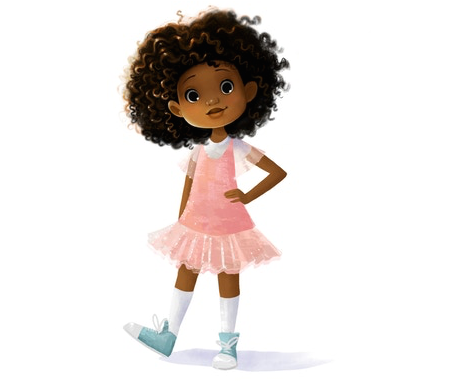 Matthew Cherry’s animated short shows young black girls, as well as their fathers, that there is nothing wrong with their natural hair and sends this powerful message through the film. Although we have called out Disney a number of times for sending such a narrow message about girls, femininity, and the idea of “happiness”, there are parts of the company where progress is being seen. The Disney Channel’s popular animated series ‘Doc McStuffins’ recently became the center of headlines after an episode featuring a family with two moms, voiced by actresses Wanda Sykes and Portia de Rossi. The episode itself was not focusing on LGBTQ issues, instead it was about how to be prepared in the event of an earthquake where the parents teaching their kids just so happened to be queer. It also seems fitting both aforementioned actresses are queer in real life. A number of LGBTQ organizations spoke favorably of what it meant to show a family with two moms as normal, rather than some tokenized or outrageously controversial thing. Kids watching this show seeing this visual representation of perhaps a different type of family to their own, or even seeing their own family reflected, can carry a lot of impact into the rest of their lives. “Shows like this reflect our real world, and today that includes the many children being raised by gay and lesbian parents who are all going to celebrate this story,” said GLAAD President and CEO Sarah Kate Ellis in a blog post on their website. Wanda Sykes also weighed in on the episode, expressing how refreshing it was that her own family gets to be part of the “norm” portrayed in mainstream media for kids. “With this episode, they see a family that looks like our family. We’re two moms… it’s going to be very exciting for [my kids] to see our family represented,” she said. There is always going to be backlash and negativity when we see marginalized and diverse voices start to be represented in the mainstream. But the disruption must continue regardless, especially for the sake of the younger generation. Being exposed to diversity from a young age can only have a positive and empowering effect on kids as they grow into adulthood. We hope to see more Matthew Cherrys challenging narrow portrayals of everyday life in animated, and also hope the bigger brands like Disney continue paying attention to the needs of the diverse society we live in.